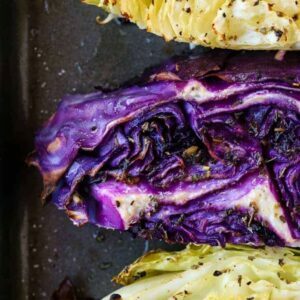 This oven roasted cabbage has a simple flavored olive oil that you baste onto the cabbage before it goes into the oven! Cut the cabbage into thick slices, about 1 1/2 inches in width. Place the cabbage in a single layer on a large sheet pan and season with salt and pepper to taste. Mix the olive oil, Italian seasoning, garlic, dijon and vinegar together in a small bowl. Divide the olive oil in half. Brush one half of the olive oil mixture onto the cabbage and roast in the oven for 15 minutes. Place in the oven for 15 minutes, then remove from the oven and baste with the remaining olive oil. Roast the cabbage for another 20 minutes until soft and browned on the bottom.